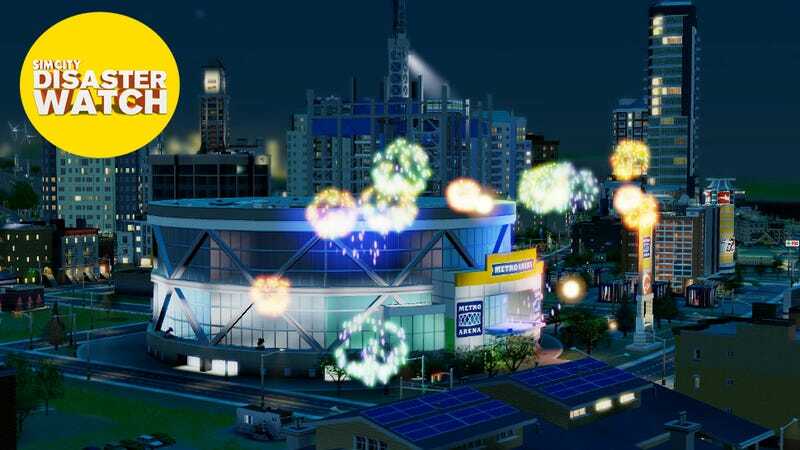 Happy One-Month Anniversary, SimCity. How's It Going? One month ago today, EA and Maxis released SimCity into the wild. The game's launch was… troubled, to say the least. In fact, you could very easily call it a disaster. Server woes, a debilitating online requirement, AI shortcomings, lost cities, and slow customer-service left many gamers angry. In the case of SimCity, a month feels like both a long time and a short time. On the one hand, it's hard to fathom that a game this massively popular could still be having fundamental problems an entire month after launching. On the other hand, it somehow feels like it just came out last week. Kotaku has been maintaining our "SimCity Disaster-Watch" since the game launched. Our plan has been, at some point, to sound an "all clear." But even now, SimCity is lacking some key advertised features; even now, it can be difficult to log in. People are still locked out of some of their cities, and the game's creators are still posting apologetic updates to the company blog. In other words: No all-clear yet. Let's take a look at the State Of SimCity, one month out. SimCity isn't fixed yet. Leaderboards still aren't in the game. AI is still weird, despite some fixes from Maxis. Some readers are still reporting that they're unable to access their cities, and in fact, I've been locked out of the city I made on the Kotaku shared region, as well as a few of my other cities, ever since the first weekend the game was out. I was still locked out as of this morning. There's an understandable hesitation to invest too much time in a city only to lose access to it—imagine if you leveled a character in WoW or Diablo III and then it vanished from the server! And so I play SimCity with a level of trepidation, awaiting the next failure or error message. Given what we've heard from some readers, I'm not alone. One of the core features that Maxis removed from the game to improve stability was cheetah speed, the fastest of the three possible speeds for the game's internal clock. That feature has been added back into the game as of about 12 hours ago. I've tried it out in my game and it works—minutes now tick by in twos, so it moves at more or less twice the rate of the middle "llama" speed. There's a big "2.0" update coming, at some point. We’ve been heads down addressing the key issues we’re seeing reported from our community. This includes city rollbacks, lost progress, and the return of features like Cheetah Speed and Leaderboards. Like you, we want all of these resolved ASAP, which is why they are the top priorities in our studio. Matter of fact, we have all of these in a QA environment, giving them a thorough test before we release them back to you, the fans. On top of this, we’re also working on a number of bug fixes and other overall improvements that we’re planning to include in future Updates. Just last week we released two Updates (1.7 and 1.8), which included traffic fixes and other general improvements. For the future, in Update 2.0, we’ll be addressing the Recycling Center bug, fixing the fire engine clumping, improving the efficiency of Street Cars, and increasing the radius of river water. We’re also fixing the tuning on Casinos and are making them more profitable. These are just a handful of the substantial changes coming in Update 2.0. I've been in touch with EA PR about the 2.0 update, and while they say it's coming soon, they can't give a specific date. They say they'll have more information for everyone next week, including more info on what'll be updated and when the 2.0 patch will roll out. Given that we recently got cheetah speed back, I'd imagine they're just about there. There's some wonderful(y tacky) free DLC. The first free DLC for SimCity has been released, and it's… a sponsored Nissan car-charging station. Huh. Well, Maxis is probably focused on fixing the game before adding to it. EA's "apology games" have been doled out. A week after the launch fiasco, EA/Maxis apologized to everyone who had bought the game and offered them a free one. Those games, which include Battlefield 3, Mass Effect 3, or, somewhat humorously, SimCity 4, have now been released, and if you've logged into Origin and have SimCity in your games collection, you should've had a chance to download one. I opted for SimCity 4, since I've never really played that game and am now dead curious about how it holds up in comparison to the new one. Things are probably going to get better. Of course, this is relative, but things are probably going to get better for SimCity, likely in the near future. Granted, they'll be getting "better" for a game that still has a long way to go until it's where it should've been at the start. The 2.0 update will likely address a lot of minor problems, though some major ones may still go unaddressed. And that'll still be annoying. In particular, we've still been unable to get any kind of ETA from EA about when our lost cities will become un-lost. It's also unclear the extent to which Maxis and EA are overhauling the game's questionable AI and often wonky simulation. SimCity will probably remain more or less what it is, it'll just work a bit better. The city sizes probably aren't getting any bigger anytime soon. It'll still require an internet connection to play—EA maintains that the always-on requirement isn't DRM, even while labeling DRM a "failed, dead-end strategy," despite the fact that our sources' reports of an always-online next-gen Xbox have people angry all over again. And so, as we await word about the 2.0 update, the SimCity Disaster-Watch is still in effect. The game has come some distance since its launch a month ago, but it's not out of the woods yet. We'll keep our eye on SimCity in the hopes that one fine day, we can finally stand down and sound the all-clear. But we're not there yet.